About fifteen years ago, the Florida Extravaganza was held at Florida International University's Biscayne Bay Campus in order to raise funds for the School of Hospitality and Tourism Management. The event "showcased wines from national and international wineries paired with food from local restaurants and chefs working with students of FIU’s School of Hospitality and Tourism Management". In 2002, Lee Brian Schrager, Director of Special Events and Media Relations at Southern Wine & Spirits of America moved the event to South Beach and expanded the event to include wine dinners, seminars, and the Grand Tasting Village. As the festival became more popular and visible - particularly with the addition of the Food & Wine Network personalities - there has been one constant South Beach Wine & Food Festival: FIU and the students of the School of Hospitality and Tourism Management. Now the students are not just sitting back and collecting corporate welfare – they are active participants in the festival and for 2009 had the most responsibility to date. Each year the students prepare a main dish that is available at the Grand Tasting Village and this year they added a dessert. The students were also responsible for providing the food for the popular champagne-drenched barbecue party Friday night for approximately 3,000 guests. Some students were even partnered with specific chefs in a mentoring relationship assisting at the Best of the Best and similar events. And to integrate themselves completely into the Wine and Food themed festival several students crafted wine and beer for the event. Actually the wine was the same wine produced last year – it had just been aging in French and American oak between festivals. On Saturday we targeted FIU’s tent in the Grand Village as our first stop and - over several samples of wine and beer - we learned more about the program from Professor Barry Gump. We learned that the School of Hospitality and Tourism Management provides several courses on these subjects including the Introduction to Brewing Science; Wine Technology; the World of Wine and Food; and The Business of Wine - among many others. Where were these courses in our college? Continuing education looks like a good idea. Professor Gump teaches several of the above courses and guided the students through the many hurdles in crafting the brews and wines. In fact several of his former pupils are now commercial winemakers. Last year several students suggesting producing a wine for the festival; Professor Gump was able to source Merlot grapes which were fermented and split in half. The first portion was used to make an easy drinking Eastern European styled semi-sweet wine that was served at the 2008 festival three months after bottling. The second portion was also split in half with one half stored in French oak barrels, the other half in American oak barrels. The wine was aged on its lees for the remainder of 2008 before being bottled separately. That is, the wine aged in French oak was bottled separately from the wine aged in American oak. Differences between the two wines were clearly noticeable. The wine aged in French oak was more complex whereas the wine aged in American oak was fruitier. Winemakers have the luxury to sample and blend in the winery so we proceeded with our own blend and added the two together – that was a good combination. However, the environment just didn’t do justice to the wines – it’s difficult to evaluate That’s what beers are for. Fortunately the FIU students crafted a few for the 2009 festival. Now these aren’t brews created from a beer kit purchased at the local homebrew shop. No, the beer was brewed in the same conditions as any craft brewery. The students must be proficient in chemistry and biology, understand brewing conditions such as gravity and ph levels, and be familiar with yeast strains and hop varieties. The first beer tasted, the Orange IPA, happened to be our overall favorite. India Pale Ales are generally bitter because traditionally, additional hops were added to the brew in order to preserve the beer for long ocean voyages. The student’s were able to balance this hoppiness with enough malt to produce a clean, refreshing ale; the end result was definitely commercial quality. Perfect for the Florida sun. The second beer was a Marzan lager – that intentionally had more malty flavors than the IPA. Unfortunately the CO2 was a little corrupted so once the foam settled – the flavor was slightly flat. The final beer was an English style stout – that means a milky flavor with less bitterness than an Irish stout. The flavor was creamy and full – even the sun couldn’t diminish the flavor. Another nice beer. At the end of our visit we were able to visit with Daniel Chaviano, who was responsible for the school’s participation in the Grand Tasting Village. Daniel is actually a recent graduate of the school and volunteered to assist his former associates. Being a south Florida native he chose FIU over several other offers because of the School of Hospitality and Tourism Management reputation and location. For he associates south Florida and particularly Miami Beach with life – a vitality that isn’t replicated anywhere else in the United States. We couldn’t agree more and think that is one of the major factors that make this event such a success. Oh yea, Daniel was one of the students who crafted the Orange IPA. Good job. Thank you FIU students and Professor Gump for your hospitality. We look forward to tasting your creations next year. For the third year in a row, WineCompass was invited to attend several events associated with the South Beach Wine & Food Festival this past February 19th-22nd. Primarily sponsored by the Food Network, Food & Wine magazine, Whole Foods, and Southern Wine and Spirits of America; the festival is a fundraiser for the Florida International University 's School of Hospitality and Tourism Management. In fact, the School of Hospitality and Tourism Management is one of the highest rated hospitality and tourism programs in the United States . According to Lisa B. Palley, our liaison to the students, “Hospitality and tourism industry executives from around the world visit the school annually to interview and hire graduates for key management-track positions in the vast array of fields in which FIU’s students are prepared. Today many of the school’s 9,000 graduates hold prominent positions in the hospitality industry around the Western Hemisphere, Europe and Asia .” Obviously a worthy beneficiary. We attend about a dozen similar events each year, but nothing comes close to this festival. Take premium wine, beer and spirits; excellent food prepared by extraordinary chefs; the vitality of SOBE and you get - heartburn and a hangover – but what a party getting there. The festival is based around the Grand Tasting Village – located on the white sands of south beach – right in the middle of the art district. (This year we planned accordingly and reserved a room at the Hotel Impala\Hotel La Flora right on 12th and Collins - 1 block from the festival entrance. Nice newly renovated hotel at a great location - and if you travel with dogs - this is your place.) Throughout the day chefs and television personalities give seminars and sign books; students from FIU’s School of Hospitality and Tourism Management cook and distribute their cuisine; and sponsors provide product samples. Delta and the Robert Mondavi Winery served wine at the entrance, while a tent for the Wines of Spain provided several styles of Spanish wine. Love the Cava and Sherry. Let’s not forget the Sauza Tequila, Cruzan rum and Russian vodka. And we haven’t even gotten to the Grand Tasting Tents. Once the Grand Tasting opened, attendees had access to hundreds of wines and spirits – plus some Amstel Light to cleanse the palate. Local chefs prepared gourmet cuisine along the outskirts of tents – all the while trying to keep pace with the excessive demands from the horde. What a logistical nightmare that was carried out rather flawlessly. The festival was not fixated just on the beach. During the day the Wine Spectator provided wine seminars at the Convention Center; while many Food Network personalities provided seminars aimed at kids at the Parrot Jungle. When the sun set, official and unofficial parties sprung out along the strip – some like the Wine Spectator’s Best of the Best – saw industrialist individuals scalping tickets. Whatever people finally paid for those tickets were worth every penny – this was by far the marquee event of the festival. Over the next few days we will be posting our experiences and observations – starting with the FUI School of Hospitality and Tourism Management students, through the aforementioned Best of the Best, to the Grand Tasting Village. We hope this tradition continues – meaning – we hope the invitation remains open for next year. 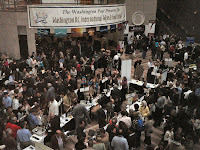 We attended another year of the Washington D.C. Food & Wine Expo which showcases wines made in practically every region of the globe. When entering the expo it wasn't difficult to start with wines from close to home since Loudoun County was allocated a prime location. Among others there was a fruit forward Cabernet Franc from Corcoran Vineyards, a creamy Viognier from Tarara Vineyard & Winery, and a sweet Raspberry Merlot from Fabbioli Cellars. Nearby a few other Virginia wineries poured wines: Orange County's Horton Vineyards and Barboursville Vineyards as well as Kluge Estate Winery. There were several other East Coast wineries such as the Maryland's Frederick Cellars, Running Hare Vineyards, and Linganore Wine Cellars. 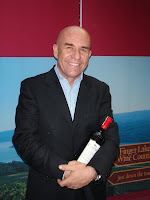 The Finger Lakes were represented by a smaller contingent than last year Standing Stone Vineyards, Dr. Konstantin Frank's Vinifera Wine Cellars, and Fox Run Vineyards. We liked the Riesling from Standing Stone and Dr.Frank's and the Lemberger from Fox Run. 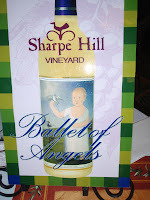 There was a surprise east coast winery, Connecticut's Sharpe Hill Winery, that was pouring a couple wines - most notably the semi-dry Ballet of Angels. Moving west, there was sadly just one Oregon winery, Evergreen Vineyards - which carries a brand of wines named after the Howard Hughes’ famous airplane: the Spruce Goose. 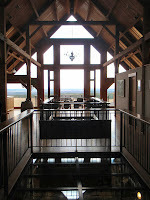 The winery had brought several wines which included a dry rose, an excellent Riesling, and several smooth Pinot Noirs. 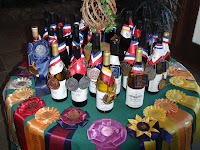 California was well represented and by several wineries we have become fans of over the years. Alexander Valley Vineyards was pouring several wines; Four Vines Winery had several Zinfandel based wines; and JK Estates - the new winery opened by Mark Gendron formerly of JanKris Winery had several excellent wines. We liked the Petite Sirah from Peltier Station as well as wines from Carr Vineyards & Winery, Brassfield Estate Winery and Hall Winery. 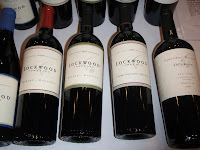 But a new favorite emerged with Lockwood Vineyard. This winery produced several wines from estate grown grapes - at extremely affordable prices. 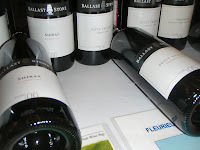 Another great value came from Australia, where Ballast Stone Estate Wines was pouring from a couple brands. This family owned winery has been growing premium grapes for decades in the McLaren Vale and Currency Creek regions. The Ballast Stone refers for the stones that ships used to maintain buoyancy with while sailing with an empty cargo. Once in Australia, the rocks would be off-loaded and whatever products exported were loaded. The stones was then used for construction. The winery's brands represent this heritage with the Steeple Jacks, the Stonemason, and the Ballast Stone brands. The Steeple Jacks Chardonnay and Merlot - which our entire party enjoyed - retails for around $6 a bottle. Good wines at bargain prices: I don't know how they do it. The Ballast Stone Estate brand wines retail for a "staggering" $15. There was an excellent Grenache, Petite Verdot, Shiraz, Cabernet Sauvignon - all great values. European wineries were everywhere - from France, Germany, Austria, Hungary, Italy, and Spain. We didn't get a chance to sample the Spanish wines, but made up for it in the other countries. The Cotes du Rhone wines were excellent and will force us to research this area more. You can't go wrong with blends made from Grenache, Syrah, Cinsault, and Mourvedre. Plus all their wines retailed for under $15. The dollar can't be in that bad shape. Moving on, we sampled interesting Pinot Noirs from Hungary and Austria - which were good, but much different from the west coast American versions. 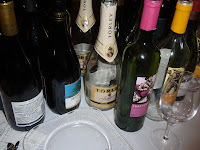 The other Hungarian wines imported by Monarchia International and Matt Brothers included two fine Torley sparkling wines and a few Craftsman and Monarchia wines. We particularly liked two whites made from the native Cserszegi Fuszeres and Olivier grapes. The Austrian wines included the aforementioned Pinot Noir plus a nice Zweigelt blend - an offspring of Blaufränkisch and most widely-grown red grape variety in Austria. Those who prefer sweeter wines flocked to the German wines and we liked a few - even the cheaper Scheurebe. But then there were the Italian varietals. Dezel from My Virginia Vine Spot joined me on a tour of these wines - starting with an American winery - Domenico Wines. Why start with an American winery, when tasting Italian varietals? Well, for one, Domenico Wines was at the same table. But, two, Dominick Chirichillo makes wines based on his Italian heritage and his family's wine making tradition. In fact Dominick learned about wine making over fifty years ago when his grandfather showed him how to use the family wine press in the basement of their New York home. Over time he moved from amateur competitions to commercial wine making after moving west to California. He still assists amateurs through the Bacchus Winemaking Club, which enables people to create their own wines with custom labels. Dominick's commercial wines have won close to 200 awards and both of us enjoyed his Miscela (blend in Italian), a Bordeaux styled concoction of Cabernet Sauvignon, Merlot, Cabernet Franc, Malbec, and Petite Verdot. Along with this French styled wine, Domenico Wines offers many Italian varietals such as Nebbiolo, Aglianico, Malvasia Bianca, and of course Pinot Grigio. From there we moved down the table trying Italian wines from various regions - all the while increasing our appreciation for that country's grapes. From the north in the Piedmont we enjoyed the Vilanna Langhe Rosso, made from Nebbiolo and Barbera and the Roero Arneis made from 100% Arneis, a native variety cultivated in the Roero area. We traveled east into Trentino-Alto Adige and the Barone Fini wines, then south through Tuscany and Abruzzo to Sicily, home of Nero d'Avola - our favorite Sicilian grape. What a ride. While Dezel called it a day, we returned to old habits: Georgian wines. 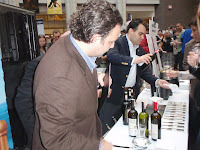 In the past few years we have become infatuated with the ancient grapes from this country and The Georgian House always have several wines available at the expo. These wines are primarily made from indigenous grapes in different styles: dry reds from Saperavi; semi-sweet reds from Mujuretuli, Aleksandrouli, and Ojaleshi; and dry whites from Rkatsiteli, Tsolikouri, and Mtsvane. These grapes that have been cultivated for thousands of years and even though they are not household names - they make excellent wines. By chance we also stumbled upon another portfolio from an old world region, the wines from Corvus Vineyards - a Turkish winery located on the island of Bozcaada. Grapes have been cultivated on this island (located across from the Trojan coast) for over three thousand years. Turkish architect Resit Soley resurrected several vineyards planting indigenous as well as more familiar vinifera grapes. The flagship wine is The Corvus Corpus, an elderberry flavor blend of Merlot, Cabernet Sauvignon, and Syrah with a smooth vanilla tail. They also produce a varietal Merlot and Cabernet Sauvignon, as well as a several wines from native grapes: Karalahna, Bogazkere, Okuzgozu, and Kuntra. These wines were very impressive - they have found a home in European cellars and are slowly making their way into the states. We can't wait to find an outlet. 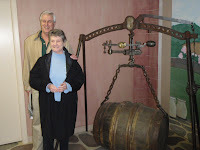 Additional photos are available at the Wine-Compass.com Compass Tours section and the Facebook WineCompass page. 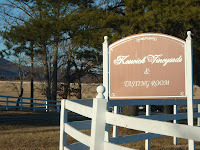 Our final stop on the tour was Keswick Vineyards, situated on the historic 400-acre Edgewood Estate. This track of land has seen its share of history - being the site where Colonel Tarleton extended his breakfast which allowed Thomas Jefferson and the Virginia Legislature to escape capture. (Thanks to Jack Jouet and Dr. Thomas Walker.) During the Civil War the confederate army under General Longstreet camped on the estate before marching to the Wilderness, waiting for his troops to disembark by rail. After Al and Cindy Schornberg purchased the estate and learned of its history, they invited Civil War historian William Leigh of Hamilton to search the area, where he discovered hundreds of civil war artifacts. Today the Schornberg's hope to make their own history by producing world class wine. After planting grapes and purchasing top-quality winery equipment, their best decision was to higher Stephen Barnard as the winemaker. Mr. Barnard comes from a distinguished South African family of doctors, which includes Christian Barnard - the first person to perform an open heart transplant and a legendary pioneer in organ transplants. Yet Stephen chose to help the heart in the different way - through wine. 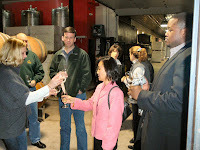 Mr. Barnard greeted us on our arrival and led us into the barrel room where wine glasses and barrel tasting awaited. While watching the carbon dioxide escaped from a Norton ice style wine fermenting in the barrel, he described his wine making philosophy, which consists primarily of "the vineyard makes the wine". "It's easy to make wine with quality grapes - its almost impossible to make good wine with poor grapes." They keep yields low by cropping and pruning and actually use only half of the 43 available acres. They don't weed the vineyards - forcing the vines to compete for water and nutrients and it allows bees and bats to cross pollinate. All the wines are made from estate grown grapes; thus he spends a good percentage of his time in the vineyard. Another interesting techniques is he uses native yeasts on occasion. And from what we tasted in the barrel -- these are good wines. We started with two styles of Viognier. The first was the Reserve Viognier, fermented with native yeast for 6-8 weeks and then aged 16 months in neutral oak. It was slightly creamy - much different than the previous Viognier wines that we had tasted on the trip. The second was the upcoming 2008 Estate Viognier which was the similar fruity style - more acidic and refreshing. We were a minority in our party that preferred the Reserve over the Estate. We also sampled a Chardonnay from the barrel made in the Chablis style. The wine is not racked for one year, allowing the juice to sit in the lees. The wine was slightly reductive, which was alleviated after several swirls of the glass. This will be a nice wine as it settles before bottling. Moving to reds we tasted a Cabernet Franc, Merlot, Petit Verdot, Cabernet Sauvignon, and a Reserve Cabernet Franc. The last was very similar to the one we just tasted at Jefferson Vineyards - very creamy. The Merlot was also a mouthful with a long finish - even with more time waiting in the barrel. The 2007 Cabernet Sauvignon will eventually be blended with the Merlot - but as a 100% varietal its pretty food. The biggest wine was the Petite Verdot - after only 3 months in the barrel it had strong tannins - that will make this wine suitable for aging in the bottle. At this young age its already a full bodied wine - possible the best of the bunch. When starting the vineyard, the Schornberg's set a goal to produce world class wines within 10 years. From our experience they are close - real close - particular with respect to their Viognier and Petit Verdot. From the moment the first colonist arrived in Jamestown, there has been a concerted effort to grow grapes in the new world - either from the English's desire to compete with France - or from the colonist's desire to reproduce life in the motherland. The early colonial governments encouraged planting vineyards by deeding property contingent on planting vines and even passing quotas on individual winemaking. The most famous colonial vintner was Thomas Jefferson who with the assistance of Italian winemaker Filippo Mazzei attempted to grow vinifera grapes around Monticello. Until then the only native grapes had been vinification on a consistant basis since they were generally resistant to disease and pests. Jefferson believed, correctly, that vinifera grapes were the future and hoped to "jump-start" the Virginian wine industry. He granted Mazzei over 2000 acres to plant grapes in addition to 50 acres adjoining Monticello on which Mazzei would build his home, Colle. Although never a farmer, Mazzei encouraged Jefferson's vision by declaring the land the most suitable for grape growing he had seen. However frost killed the initials year's crop and the Revolutionary War soon followed. Mazzei threw away his plow for a musket and the vineyard fell into disrepair. It was completely destroyed after Mazzei rented Colle to a captured Hessian officer. According to Jefferson, “Riedesel’s horses in one week destroyed the whole labor of three or four years; and thus ended an experiment which, from every appearance, would in a year or two more have established the practicability of that branch of culture in America." Event without Mazzei, Jefferson continued to experiment with vinifera vines - but not surprisingly - each effort failed. For without modern vineyard techniques - vinifera grapes would never succeed in this climate. By the turn of the 19th century, Jefferson did find success with the Alexander grape, a chance hybrid between an native labrusca and vinifera. By 1811 his vineyards had been replanted with 165 cuttings of Alexander and he apparently became accustomed to the grape's unique flavor. But no longer were vinifera vine grown around Monticello. In 1981 the Woodward family decided to replicate Jefferson's vision and with the assistance of a young Gabrielle Rausse, they replanted the vinifera vineyards that Mazzei had first planted over two years earlier. Rausse, by the way, had successfully planted vineyards at Barboursville Vineyards a few years earlier and has been a regular consultant with other vineyards surrounding Charlottesville since. He also has his own brand, Gabriele Rausse Winery, available for purchase in several Charlottesville retail outlets. 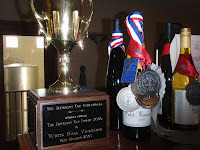 But back to Jefferson Vineyards, they have been making award winning wine since this first planting. A few years ago, they hired Andy Reagan to "jump-start" the winery, which had become a little stagnate in the preceding years. Reagan planned to use his experience in several East coast wineries (Benmarl Winery & Vineyard and Chrysalis Vineyards) to boost Jefferson wines to national and international class. Andy met us in the tasting room and lead us on a short tour of the facilities. This is a small operation. They only have 20 acres of grapes planted and produce about 5,000 cases a year. Yet they produce a large portfolio of wines - and primarily the vinifera wines that Jefferson initially attempted. There was Chardonnay, Gewürztaminer, Pinot Gris, Viognier, Cabernet Franc, Merlot, Cabernet Sauvignon, Petit Verdot, and a Meritage blend. In fact Reagan even blends his "100%" varietals, adding just enough wine from other grapes to legally declare the wine a 100% varietal. Some may quibble with this approach, but it works. The wines were fantastic - the closest to Veritas that we had found since we had left that winery. The 2007 Viognier was excellent and a top medal winner. It includes a small percentage of Petit Manseng and Pinot Gris to add balance. The Reserve Chardonnay was also nice - aged sur lies and made from only the best grapes . I was aged in oak where the heads of the barrel were re-toasted; an interesting approach. This provided a slightly buttery finish - but the initial taste was refreshing and acidic. The reds were even more outstanding. The Reserve Cabernet Franc was the favorite of several in our party - it seemed to just melt in the mouth; for us the Merlot was awesome. Others preferred the Reserve Petit Verdot. Or maybe the Meritage. Basically they were all excellent wines - full bodied, oak aged - but still fruity; some had spicier tails, others more tannic; but all drinkable now. This was a fun round of drinking with almost everyone admiring the next sample - although there were a couple of dissenters... But for us, we will return - Jefferson would be satisfied. We started the second day on our Monticello Wine Tour at Blenheim Vineyards, the domain of the Matthews family: Peter, Kathleen, and Dave. The winery is located in historic Blenheim, an area first granted in 1730 to the John Carter - the Secretary of the Colony of Virginia. Different properties were built and inhabited on the property - with the oldest being the Claims House - built in the 1730's. In 2000 Dave and Peter Matthews, along with partner and winemaker Brad McCarthy planted vines in order to create a winery on the site. The goal was to create a new style of wines, free from oak, the McCarthy saw on a regular basis as a winemaker in California. The winery operated privately for the next eight years with Peter managing the vines and Brad producing the wine. The winery was open by appointment only - so the wines were sold in neighboring retail outlets - basically by word of mouth. 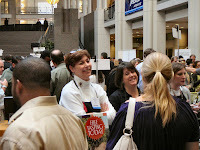 In 2007 McCarthy left, leaving Peter as the Directory of Operations. 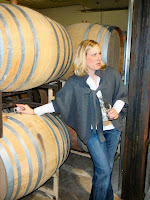 In June 2008 he hired Kirsty Harmon as the new winemaker and that is who greeted us on our arrival. The winery building itself is a fascinating structure. It's enormity is hidden as the entrance is located on the down side of a hill - and the actual operations located beneath the slope - think of a walk out basement below a house. The fermenting and aging operations can be viewed from the tasting area through glass floors that run the length of the facility. The steeple ceiling and skylights provide character - and apparently no lights are required to brighten the tasting area during the summer. Looking out the back, Blenheim's vineyards spread out on the left, while neighboring Kluge Estate's vines are seen directly in the distance. This is a great location to hang out; and open area with excellent views. Our party of 12 comfortably settled into a long wooden table - ready to try the wines made from Ms. Harmon's predecessor. The winery currently offers three Chardonnay brands, the Star label, Ox-Eye, and Blenheim Farm. Of the three the two vineyard specific wines were the best - the Ox-Eye grown near Stanton, the Blenheim Farm on the estate. The Ox-Eye had an interesting hazelnut tone whereas the Blenheim Farm was more acidic and refreshing. For reds, Blenheim currently offers a Cabernet Franc, Meritage blend, and Petit Verdot. The Cabernet Franc was decent - nothing special, whereas the Meritage was a very good ever day drinking wine. It's lighter than most Bordeaux styled blends but has a nice cherry flavor. Plus its marked down to $10 in order to move inventory. Finally, the Petit Verdot was the full bodied red offering - made from estate grown grapes. It has some blackberry flavors and with enough tannins to encourage aging. It was a little awkward having Ms. Harmon describe wines she did not produce - so we headed into the fermenting area to sample her products. Blenheim's new winemaker took an interesting route to that position. She graduated from the University of Virginia in 1998 with a degree in biology and work with yeast strains for a number of years. Over time she developed an appreciation for wine and apprenticed with local winemaker Gabriele Rausse (look forward to our posting on Jefferson Vineyards to learn more about Rausse). Eventually she attended UC-Davis and in 2007 graduated with an M.S. in Viticulture and Enology. After graduation and pre-Blenheim she worked in France and in New Zealand honing her skills. Back to Blenheim we started with Viognier aging in steel - the wine was already crisp and fruity and look for bottling sometime in April. We moved to the barrels and sampled some free run Cabernet Franc and a more tannic version - with the fruit forward wine ready to drink now. She will eventually blend the two after determining the precise balance of fruit and tannin. The biggest surprise was Cabernet Sauvignon aging in a barrel. In general we are not fans of Virginia made Cabernet Sauvignon, but this version has potential. It actually had body and texture and should make a wine worth aging. We will look forward to this one as well as her Petit Verdot - which we realized is Virginia's nest hope for red wine. The future is definitely bright at Blenheim. A new tasting room and new winemaker should make this winery a popular destination. We pass the winery on our frequent trips to Scottsville - so look for us on the deck. We may not even make our final destination. Our final stop on the first day on the Monticello Wine Trail was White Hall Vineyards, home to one of our favorite Virginia wines, their Petit Manseng. This wine has been a staple in our wine cellar after finding it in the discounted wine box at Norm's Beer & Wine. Evidently someone had ordered a case and failed to pick it up. And we capitalized on that mistake. 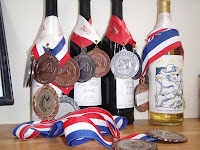 In the following year, the wine was awarded the Governor's Cup for the most outstanding wine in the state. White Hall is located at the base of the Blue Ridge Mountains, about 13 miles east of Charlottesville. Tony and Edie Champ opened the winery after years of venturing out to California's wine country and wanting to do the same on the east coast. They settled on Albermnarle County and planted the estate vineyards in 1992 starting with with 6 acres of Chardonnay, Cabernet Sauvignon, Merlot, and Cabernet Franc. More varieties were added later including Viognier, Petit Verdot and Petit Manseng. By the way, the Champs were incredibly gracious hosts, having to endure a tour of slightly inebriated guests. Walking into the tasting room felt like walking into the a trophy shop. Their were medals from Virginia, California; pictures with Governors; trophy cups - a complete hall of fame. The Champs have done well over the years. The have also chosen a completely different business strategy than the previous wineries we visited that day. Instead of selling wine strictly through the tasting room and utilizing weddings and events - White Hall sells about 85% of their inventory at retail outlets. As a result- the tasting bar is small - and there was a steady flow of only a handful of visitors during our stay. White hall produces a large portfolio of wines - in different styles so that any visitor should find something to their liking. For whites we started with Pinot Gris, Chardonnay, two vintages of Gewurztraminer, the fore mentioned Petit Manseng, and Viognier. The first vintage of Gewurztraminer was drier than the second - and a nice alternative to the usual semi-dry style. The Petit Manseng was acidic and refreshing - not as fruity as the previous year - but nevertheless a good wine. We also learned that Viognier should be warmed at room temperature - since this wine if served too cold - loses its aroma. After cupping the glass in our hands - the aroma and apricot flavors appeared. Another good Virginia Viognier. At this point our hosts guided on a tour of their production facilities, starting at the crush pad, through the fermenting and aging tanks, and the barrel room. We tasted muscat aging stainless steel and learned that this wine is added to the Pinot Gris, Petit Manseng, and Viognier to enhance the aroma. In the barrel room we sampled aging Merlot and Petit Verdot - showing their will be a good 2008 vintage. Back at the tasting bar we finished with their reds - starting with a lighter bodied Cabernet Franc event though it was aged in oak for 10 months. There followed a Syrah and our two favorite wines of the visit, the Touriga and Cuvee des Champs. The first is 100% Touriga Nacional which was fermented in small bins and then aerated using the Delestage method. The juice is then aged for ten months in French and American oak - producing a very good wine. The Cuvee des Champs is a Bordeaux styled blend using the 5 classic varieties and then aged 18 months in oak. This is a big wine - full of flavor - and a smooth tail. We finished the day with Edichi, their port styled wine made from Touriga, Petit Verdot, and Tannat and named after our host - Mrs. Edith Champ. This is a much lighter dessert wine than the standard port - lower in alcohol and sugar. I can envision some patrons purchasing this wine for regular consumption - not just for dessert. By this time - we were done - tired - physically and of wine. Where's a beer. Fortunately we had chartered a bus - there's really no other alternative after such a day. We want to thank the Champs, the Kings, and Ms. Pelton for an awesome day. Our second stop on the Monticello Wine Trail was King Family Vineyards, the apparent winery of choice for University of Virginia students. For when we arrived, there were approximately 200 filling the tasting room and the patio. Who needs a keg party when a winery is close by - particularly on the first warm day of the year. Location, Location, Location. And David and Ellen King specifically chose this location when relocating to Charlottesville from Texas. The desired a large flat area for their thoroughbreds and found the flattest land in Albermarle County. Perfect for polo matches. They soon realized, however, that they need to find an economic value for the property - and chose to plant a vineyard. The first vines were planted in 1998, that produced only 500 cases a few years later. Today the winery is still a "boutique" operation, producing about 5,000 cases annually from virtually 100% estate grown fruit. 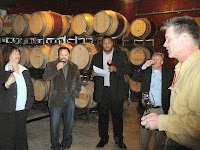 On our arrival, David King lead us into the barrel room away from the keg party where his wine portfolio was waiting. While sipping a glass of their methode champenoise style Brut, Mr. King informed us of his background, the winery's history and where he'd like to see the industry move. In fact he'd like Virginia to move away from "It's stupid for Virginia wineries to make California styled wines - we should grow grapes suitable for our region". This doesn't mean excluding vinifera wine from their portfolio - it means finding the correct grapes for their micro-climate and vinifying them in a unique style - not in the big, high alcohol, styles made out west. And later, winemaker Matthieu Finot reiterated this point by commented that "I don't believe in Cabernet Sauvignon or Sauvignon Blanc will help Virginia wines to make a name. We should pick the varieties more suitable such as Petit Verdot, Viognier, Petit Manseng and possibly Albarino." The 2007 Chardonnay was a great example of a Virginia made vinifera. It was fermented and aged in 70% neutral/30% new oak barrels for nine months which provided a slight smoky flavor with some vanilla - but allowed the fruit flavor to stand out. The same is true for their Viognier, which was fermented and aged 80% stainless steel tanks and 20% oak barrels. Once again this method provided some vanilla tones, but allowed the apricot fruit flavors to dominate. The only disappointment with the whites was the Roseland, a blend of 55% Viognier and 45% Chardonnay. Each variety was excellent as a single varietal, but the blend sort of washed out the distinctive qualities of the other grape. From a business decision it makes perfect sense to blend your lessor quality grapes - and we're sure the wine was selling quickly outside that day - but we definitely preferred the single varietals. Moving to reds, we started with the Cabernet Franc - a mouthful of strawberry flavor. There's a hint of spice at the tail - but in general a smooth finish. The Merlot was even better - as Mr. King explained that this grape grows very consistently year to year. This is a good wine - full bodied with cherry flavors - which lead to their best red - the Meritage. A blend of 60% Merlot, 20% Cabernet Franc and 20% Petit Verdot; the wine was aged for 18 months in French. "The Merlot provides the core fruit with black cherry dominating. The Cabernet Franc rounds out the palate with fresh raspberry notes. The Petit Verdot adds depth, structure, color, and a slight floral character." This wine was awarded a Gold Medal at the 2008 Monticello Cup - a group favorite. The final wine was the Loreley 'Late Harvest Viognier' made in an "ice wine" style. The grapes were frozen immediately after harvest which provided the concentration in sugar. This wine is pure apricot and similar to a Tokai Furmint. It was obviously sweet but without any gritty sugar sensations. A nice dessert wine. Since we couldn't budge close to the tasting bar, we'll be back on a quieter weekend - or perhaps to watch a polo match. The countryside and wines are worth a repeat visit. Our first stop on the Monticello Wine Trail was Veritas Vineyards, located just southwest of Charlottesville at the foothills of the Blue Ridge Mountains. Andrew and Patricia Hodson planted their first vines about a decade ago and opened the tasting facility in 2002 - selling wine from the 2001 vintage. They named the winery after the Roman historian, Pliny the Elder's statement: “In Vino Veritas” ~ “In Wine There Is Truth”. Their goal was to create high quality vinifera wines and with the assistance of their daughter Emily Pelton they have largely succeeded. And don't think that hiring your daughter is just another case of nepotism; Ms. Pelton earned a Masters in Enology at Virginia Tech and was recently awarded the Judges Choice Award at the 2007 National Women’s Wine Competition in California. On our arrival, Emily and resident sommelier Thomas Roberts escorted downstairs to the fermenting and barrel areas. Amongst large steel tanks we learned about the winery operations and their other goal of educating consumers on wine\food pairings through classes, private events, and weddings. Plus, these events are great opportunities to sell wine. During the discussion we also sampled their wines, starting with a Sauvignon Blanc - made in the Loire style. It was dry and crisp - nice for a varietal that we usually find as too weak in Virginia. We followed with a couple versions of Chardonnay and Viognier and what was exceptional about these wines is that we were tasting directly from either the tanks or barrels - basically the wines were only a few months old. The Viognier was most impressive - peaches and apricots - and its excellent character is why the previous vintage was awarded a double gold in San Francisco. Moving to reds, we tasted from several barrels of Cabernet Franc, starting with a fruit forward version made from free run juice. There was no tannins in this sample - just cherry fruit flavors. We moved to two other barrels that contained wine made from grapes picked from the same vineyard lot - just a week difference. The wine was completely different - the first seemed fresher - some in our party smelled and tasted Violets - interesting for such a young wine; whereas the wine from the lot picked later was more tannic. Who knew that one week could create such a divergence in flavor. We continued with Merlot and Petit Verdot - the first solid, but the second exceptional. After only a few months in the barrel the Petit Verdot was already full bodied and spicy - no need to blend here - this is a single varietal. Emily also poured versions of their port-styled wine Othello where the Tannat and Touriga Nacional are fortified and aged separately. Finally we were lead into the sparkling wine room where amongst riddling racks we sampled their Mousseux - a dry sparkling style wine. The wine is an equal blend of Chardonnay and Cabernet Franc and is extremely dry - think dry raspberries - and very unsuspecting with the pink color. What a fantastic start for our trip. 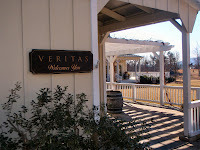 Veritas set a very high benchmark that we would use to judge the other wineries. 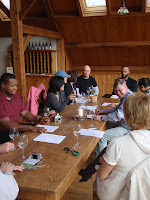 In the coming months, the Veritas wine making staff will need to determine how to bottle the wines we tasted. Some will be sold in the tasting room as 100% varietals, others will be blended to produce a Claret or Meritage. Partly science, mostly art - they will continue to sample the wines in the barrel until they can determine its final destination. We look forward to returning after bottling to sample the final result. Last month, at a weekly wine tasting, several of us discussed the various wine regions in Virginia and which, as a region, were producing the finest wines in the state. We concluded that perhaps the Monticello area was sovereign, and to prove our hypothesis we planned a visit to the region. Our excursion was organized by Jim and Lori Corcoran - the proprietors and winemaker from Loudoun County's Corcoran Vineyards. The Corcorans make some of the best Cabernet Franc and Viognier in Loudoun County and they were looking forward to an exchange of ideas with other winemakers. Our party also consisted of other experienced wine professionals including Mary Watson-Delauder, a sommelier who graces the current cover of the Virginia Wine Lover Magazine; her husband Rick Delauder of Australia's Ballast Stone Estate Wines; wine writer Dezel Quillen from My Virginia Vine Spot; Michael Ching, a partner at The Winery of LaGrange; and a few other wine connoisseurs. Our destination was several of the top wineries surrounding Charlottesville: Veritas Vineyards, King Family Vineyards, White Hall Vineyards, Blenheim Vineyards, Jefferson Vineyards, and Keswick Vineyards. In the upcoming weeks look for separate articles on each winery, but we have several general conclusions we'd like to share. Overall, our initial hypotheses was not validated. Whereas we did sample some tremendous wines, there was enough doubt among us to conclude that many wineries in northern Virginia make comparable wines. Instead, the trip exposed the potential in Virginia wines and introduced us to a new generation of young winemakers who are striving to produce world class wines. In most cases, the wine making was conducted by a young, educated winemaker - we are talking about winemakers in their 20s and 30s - who have both the experience and geographic background to add value to their products. At Veritas Vineyards, Emily Pelton has taken over the daily wine making chores from her father Andrew Hodson and is producing over a dozen still and sparkling wines that were first class. Kirsty Harmon (Blenheim Vineyards) is beginning to inject her experience working with Gabriele Rausse and in France and New Zealand to enhance the winery's portfolio. The same holds true for Stephen Barnard (Keswick Vineyards) who uses many techniques that he learned in his native South Africa to produce excellent wines. And Andy Reagan (Jefferson Vineyards) uses his background at several mid-Atlantic wineries to produce a portfolio of great Bordeaux-styled wines. Matthieu Finot, from King Family Vineyards, was not able to meet with us, but his credentials include working in his native France, as well as in Italy and South Africa. The future is definitely bright at these wineries. In addition, the quality in the wines made by the female winemakers lead many in our party to suggest that, in general, females are better winemakers than men. That's another interesting hypothesis we can discuss at a later date. More importantly we saw the direction where these wineries want to lead Virginia in terms of wine grapes. In the past, many Virginia wineries have gambled on different varieties, hoping that they would elevate Virginia in the wine market. Some thought Norton, others Chardonnay. In the past few years many wineries thought Cabernet Franc. And over the weekend we tasted several excellent versions of this wine. Virginia wineries make excellent Cabernet Franc - but are they world class wines? 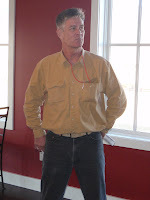 We also discovered several excellent Merlot wines and learned from David King that it grows rather consistently from year to year in the state. Normally not pleased with Virginia grown Cabernet Sauvignon, we tasted a fabulous version aging in the barrel at Blenheim. We also sampled good Touriga and Petit Mensing at White Hall and Sauvignon Blanc at Veritas Vineyards. But, as good as all these wines tasted, two grapes clearly stood out, and we believe that these grapes have the best potential to elevate Virginia wines to world class status. We are referring to Viognier and Petit Verdot. The first is not surprising since many wineries have been producing excellent Viognier over the past decade. Interesting, this ancient grape was recently threatened with extinction for as late as 1965 there was only eight acres planted in Northern Rhône. Considering the history of the grape (it migrated to the Rhône region with the Romans) and how well it has rebounded, that would have been tragic. Particularly since it also produces excellent wines. Each winery we visited had a superb Viognier wine - regardless of style - that would hold their own against California and Rhône produced varietals. As for Petit Verdot, this grape is normally used in Bordeaux blends and is a relative newcomer in the state, yet almost each winery we visited choose to vinify it. And as a 100% varietal. The winemakers recognize the potential in the grape and believe that is very suitable for their climate. And in each instance, the wines were fabulous; full bodied with depth and tannins worthy for further aging. We have seen the future for Virginia....and its not Cabernet Franc, or Norton. Finally, we listened to fabulous discussions on wine making. Stephen Barnard stressed how managing the vineyard was the single most important factor in making good wines. And in a later email exchange, Matthieu Finot reiterated that point. At Veritas Vineyards we tasted how the juice from the same grapes picked from the same lot produce different wine depending on when they were picked. At Blenheim Vineyards and Veritas Vineyards we compared the fruitiness of free run juice against more tannic juice from grapes pressed once or twice. 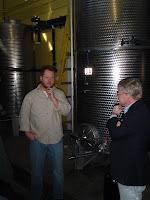 We discussed blending, yeast, malolatic fermentation, racking, and several other principles involved in making wine. And we talked screw caps. Some wine makers wanted to convert their entire portfolio to this closure device in order to eliminate the cork taint caused by TCA, others only the whites. Nevertheless, all hesitate since the general public still associates screw caps with cheap wines. But they expect to release more wines closed with screw caps - at least white wines; but until the public's perception changes - keep the corkscrew handy. This was the type of trip that every wine consumer should experience. Although we did get special access due to the Corcoran's association with the wineries, the average taster can plan a similar venture. Many wineries hold wine classes that explain their wines and are usually taught by the winery's winemaker. 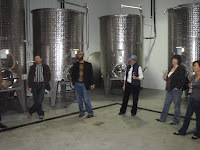 In other instances the winemaker assists in the tasting room, providing an excellent opportunity for interaction. Research before you travel - start at wine-compass.com, find wineries and events in your destination and drill into the winery's website. Contact the winery directly, the information is available; it just takes planning. Next up, Veritas Vineyards. Wouldn't it be great if you could always taste a wine before purchasing? No more basing your decision on someone else's suggestion or a winery's reputation. That is the premise behind a new wine dispensing system slowly gaining a foothold in Virginia: The Enomatic Wine Serving Systems. The concept behind this Italian system is quite simple. Each model holds a certain number of wine bottles in a temperature-controlled case and the wines remain fresh for approximately 30-45 days. The wine is dispensed using a pre-paid wine card so that consumers can sample different wines at their own pace. Worried about hygiene? After dispensing the wine, the system automatically cleans the spout. The system is particularly attractive for novice wine consumers who may feel intimidated ordering wine. Of the four available models, the Enoline is the most popular. This dispenser holds 4 to 8 bottles and the wines can be stored at room temperature, refrigerated or climate controlled. Thus, both red and white wines can be stored. The Enoround model holds 16 wines at room temperature in a circular base and is intended for red wines. The Enomove is a portable system attached to a trolley and the Enomodule is a customized system that can create a continuous line of bottles. In Virginia, the Enomatic is currently being used in several wine bars, retail shops, and one winery - Boxwood Winery. Boxwood is not your average family owned and operated winery. John Kent Cooke, the former owner of the Washington Redskins, founded the enterprise. His daughter, Rachel Martin, is the winemaker. With the assistance of consultant Stephane Derenoncourt, Ms. Martin crafts three Bordeaux style wines: a rose and two dry red wines. The Boxwood is a left bank Medoc blend consisting of Cabernet Sauvignon, Merlot, and Petite Verdot, whereas the Topiary is a right bank Saint Emilion styled wine composed of Cabernet Franc, Merlot, and Malbec. Instead of opening a tasting room at their winery, Boxwood opened a tasting facility on Main Street in Middleburg. In order to dispense their wines they chose the Enoround model, suitable for their red wine inventory. Obviously Boxwood does not produce enough wines to fill the container, so they include several Bordeaux brands produced by other wineries in which Mr. Derenoncourt consults. An added benefit is that consumers can determine how well the Boxwood wines compare to the French wines. The success of the Middleburg tasting room has enabled Boxwood to build a second facility in the Reston Town Center, which should open the beginning of March. The driving force for legalizing the Enomatic system in Virginia was the Whole Foods Corporation. After Virginia State officials approved its use, Whole Foods opened wine tasting rooms in their Fairfax and Glen Allen stores. The tasting rooms contain almost a dozen of the devices, holding over 80 wine bottles. 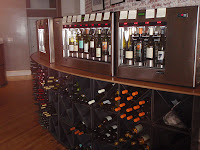 Currently only the Glen Allen store dispenses a Virginia made wine, the Cooper Vineyards Noche Chocolate; but there are also two other wine bars that include Virginia wine in their Enomatic systems. The Kybecca Wine Bar is located in an historic general store in downtown Fredericksburg, which Kyle and Rebecca Snyder have painstakingly restored to its original brick façade. They have several Enomatic systems that dispense approximately thirty wines, each available for purchase in their adjacent retail shop. On our visit, the Virginia Wineworks White was the lone Virginia wine being dispensed by the Enomatic. Warrenton's Iron Bridge Wine Company also dispenses Virginia wine from their three systems. They use an Enoround model for the red wines and two Enoline models for the white wines. Where else can you taste a Rogers Ford Farm Winery Sumerduck alongside a Châteauneuf-du-Pape? Finally, a few other Virginia establishments utilize the Enomatic: Church Street Cellars in Vienna, Evo Bistro Wine Bar in McLean, and Maison du Vin's two stores in Great Falls and Reston. In fact, both Maison du Vin stores use the enoline model for their free daily tasting, so there is no need to purchase a wine card. The price of some of these machines are high (close to $20,000 for the Enoround), so it will be interesting to see if they are cost effective in the long run. Since Boxwood Winery and Maison du Vin have purchased machines for multiple locations, it appears that they have concluded in the affirmative. If other retailers make similar judgments, then expect the number of Enomatics in operation to increase; otherwise the Enomatic may become just the latest wine fad. The full article is also available at the Virginia Wine Lover Magazine. Most new wineries open just after planting their first vines, in which they must first produce wine from fruit purchased from other vineyards. This process must continue until their vines mature enough to produce quality grapes. Not so Loudoun County's Sunset Hills Vineyard & Winery. About a decade ago Diane and Mike Canney planted grape vines - particularly Chardonnay - well before constructing a winery. They allowed the vines to develop and mature while at the same time, they began refurbishing a barn, originally built in the 1870's, with help from an Amish construction team. They named their enterprise Sunset Hills, after the "beautiful sunsets" the couple witnessed as the sun fell below the western mountain ranges. 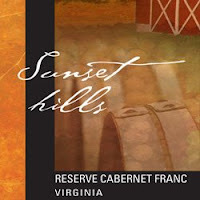 Last year Sunset Hills Vineyard opened officially, specializing in Bordeaux style red wines; Cabernet Sauvignon, Cabernet Franc, and Petit Verdot; as well as Chardonnay and Viognier. We remember that their Petit Verdot and Viognier stood out at last year's Vintage Virginia and looked forward to a visit. On a cold Saturday afternoon, the winery was already crowded when we arrived with earlier visitors settled at tables on the loft and in the tasting area. We started with the two versions of chardonnay, the first aged in stainless steel, the other aged in neutral French oak sur lee. We have become fans of unoaked Chardonnay, but today we preferred the oaked Reserve Chardonnay. Maybe its a result of the season - but it tasted more full bodied with only a subtle buttery flavor. The viognier was aged in the same fashion as the Reserve Chardonnay and this was a favorite. It has a sweet honey aroma, with a slightly pineapple flavor - this is the one we took upstairs with an array of Amish cheese. The Cabernet Franc is a medium bodied wine ages 18 months in neutral French and American oak. It has a more raspberry flavor than cherry - and low tannins at the tail. On the other hand, the Cabernet Sauvignon was more full bodied and had a more tannic finish - probably from 17 months in French oak. Not bad for a Virginia Cabernet Sauvignon; but interestingly we enjoyed the whites more than the reds. We look forward to returning after the ice clears from the patio. Sunset Hills Vineyard is in a great location - excellent views and close to other excellent wineries. Its even a short ride from the O&D Bike Path - we can't wait until summer.